Did you know? We count impressions of website content units only when at least 50 percent of a unit is actually visible on the user’s screen for at least a second. We call it “real impressions.” This ensures you know how users really engage with certain parts of your site. 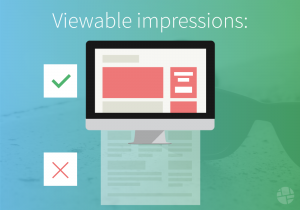 Unique to Dynamic Yield, a “real impression” (also known as: “viewable impression”) is an instance where an ad is fully loaded before being counted as an actual impression. In other instances, impressions can be recorded when a server has partially displayed an ad, regardless of how long it was available for a website visitor to actually see the ad. It is important to know if your ad has loaded partially or completely as this can impact your marketing strategy. For example, if your report says an ad was shown 10,000 times, but only clicked on 100 times, you may consider this a low click-through rate. However, if you were informed that out of the 10,000 times your ad was shown, it only fully loaded 1,000 times, your click-through rate increases substantially and the performance of your campaign improves dramatically. Knowing if each “impression” is loaded completely or not can only be determined by speaking at length with your ad provider and/or reading your fine print. With Dynamic Yield, you know up-front that each impression loads 100 % or it is not counted. When you use our impression total to calculate your click-through rate, each impression is valid and real and had the opportunity to be seen each time it was shown.